Malaika Uwamahoro in Miracle in Rwanda. Photo by Carol Rosegg. BOTTOM LINE: Fervent faith in God and simple luck intersect to save one Rwandan woman from death during the 1994 genocide against the Tutsi people. Immaculée Ilibagiza’s compelling story of human resilience, the autobiographical Left to Tell, recounts what it was like to spend three months crammed into a tiny bathroom in her pastor’s home in Mataba, Rwanda, in order to evade Hutu soldiers at the height of her country’s civil war. By the time Ilibagiza sought sanctuary, conflicts between the country’s majority Hutu and minority Tutsi populations had been raging for decades, but when President Juvenal Habyarimana’s plane was shot down on April 6, 1994, the Tutsi-led Rwandan Patriotic Front was blamed and Hutus were instructed to kill their Tutsi neighbors. The resulting genocide left between 800,000 and 1 million dead before a cease fire was reached 100 days later. It’s an atrocity, and the fact that it occurred with little to no intervention from the United Nations or neighboring countries is a disgrace. That said, Miracle in Rwanda tells just one story—that of Ilibagiza. And while the horrifying conditions in which she was forced to hide, along with seven other people—several of them ill and all of them starving—are made vivid by Malaika Uwamahoro’s brilliant portrayal of numerous people, including the then-24-year-old Ilibagiza, the minister who sheltered her, and the raiding Hutu marauders, Miracle in Rwanda focuses less on the history and politics of the conflict and more on how Ilibagiza found the strength and compassion to absolve her tormentors. Throughout, Ilibagiza’s fierce devotion to Christianity is on display, but when she recites the Lord's Prayer, the audience hears her grapple with the concept of forgiving “those who trespass against us.” Her repeated stumbling when she reaches this phrase is emotionally resonant. This becomes magnified later, when she thinks about Jesus’ suffering on the cross: “As you were dying you said, ‘Forgive them Father for they know not what they do.’” This recognition leads Ilibagiza to a perhaps unexpected conclusion. “When I hate them, it keeps me in hell with them,” Uwamahoro tells the audience. “I feel better thinking about letting go.” At the conclusion of the fighting, when Ilibagiza is in a refugee camp, she goes one further, “Forgiveness is the only thing I have to give,” she shrugs. Ilibagiza’s grace and resilience—in addition to prayer she dives into a French-English dictionary provided by the pastor to teach herself a new language—is inspiring. Likewise, the bold actions of a courageous pastor who defied Hutu warlords and deflected in-home raids and near-constant threats, are impressive. Nonetheless, despite the fact that Miracle in Rwanda is heartening, it also seems superficial. I wanted to better understand why so many Hutus were willing to turn against the Tutsis. What were the roots of their tribal animosity? Was there a history of economic exploitation? Or was the hatred of the Hutus a legacy of the country’s colonial past? 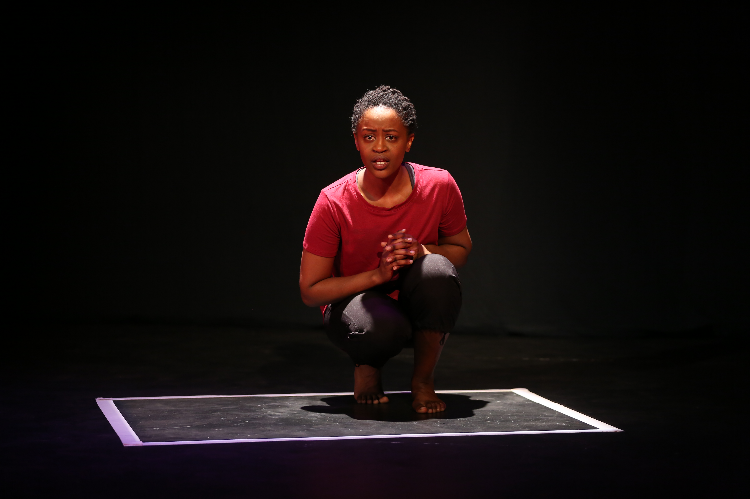 In addition, while we’re repeatedly told that Ilibagiza shared a three-by-four foot room with numerous others, it is easy to forget this because she moves so freely on stage as she tells her story. Gina Costagliola and Erich Keil’s lighting direction, however, is masterful, allowing Uwamahoro to seamlessly shift characters as the account unfolds. Still, a more comprehensive frame would illuminate this shameful chapter in world history and elevate Miracle in Rwanda from a story of individual transcendence to something deeper. Miracle in Rwanda is by Leslie Malaika Lewis and Edward Vilga, based on the book Left to Tell by Immaculée Ilibagiza. Directed by George Drance. Lighting Design by Erich Keil and Gina Costagliola. Sound Design by Taiwo Heard. Stage Manager is Sheree V. Campbell. Understudy is Nisarah Lewis. The cast is Malaika Uwamahoro.